Teni had a brilliant year in 2018, a year that could be referred to as her best yet. The singer dropped some really sick tunes like “Askamaya,” “Fake Jersey,” “Wait,” “Case“, “Uyo Meyo” etc. which really got her build a fan base and further expanded it. Aside from the songs she dropped, she had few collaborations with other industry artistes too, but they didn’t really do well. 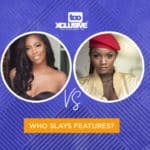 She’s had collaborations with Phyno, Shizzi & Mayorkun and a few others which did not leave a mark unlike her singles. 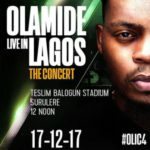 But in this industry, one of the ways to certify your ingenuity as an artiste is also to do well on other people’s songs so one could be a force to reckon with. Unfortunately that has not happened for Teni, so we are wondering what the problem could be, could it be that she’s been on the wrong collaborations? 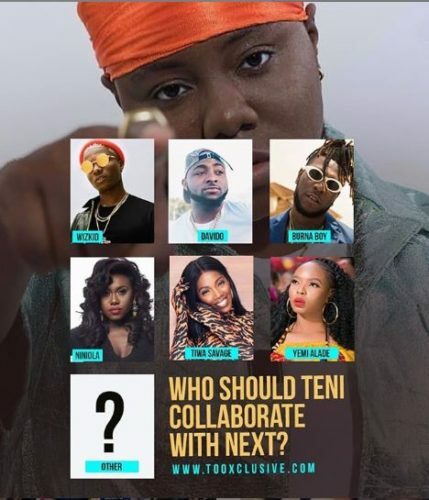 If so, that leaves us with a question; who next do you think Teni should collaborate with? 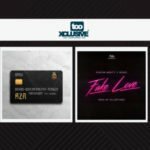 “Aza” VS “Fake Love” : Which Is Hotter? 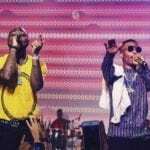 Davido Or Wizkid’s Album, Which Are You Anticipating The Most? She should collaborate with Bharry Jay …..
she did well with boj.she will do well with any artiste that cab. Burna boy or Adekunle Gold. Burna boy, Wizkid, Adekunle Gold or 2face Idibia. 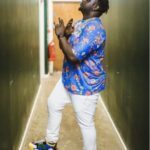 Teni will collaborate with CHUVANO. Teni knows the international artist, collab with wizzy. Teni remember starboy dey for youuuuuuu. teni collaborate with Tekno,Rudeboy or Flavour. Please go search for sakodie ..